With Gewista GIS, developed by WIGeoGIS, the advertising industry has a new tool for the spatial navigation and planning of outdoor campaigns. Navigation in the world of advertising media takes place either as a map or a search for a location or an exact address. Afterwards, the advertising media city light, billboard and rolling board can be visualized on the map using a filter. Hovering the mouse over a marked point on the map will immediately display information about this location: exact address, format, advertising medium. Clicking on the points on the map, which are color coded according to the type of media, will display photos of the individual advertising media at that location. This allows the viewer to gain a perfect overview of the location environment. 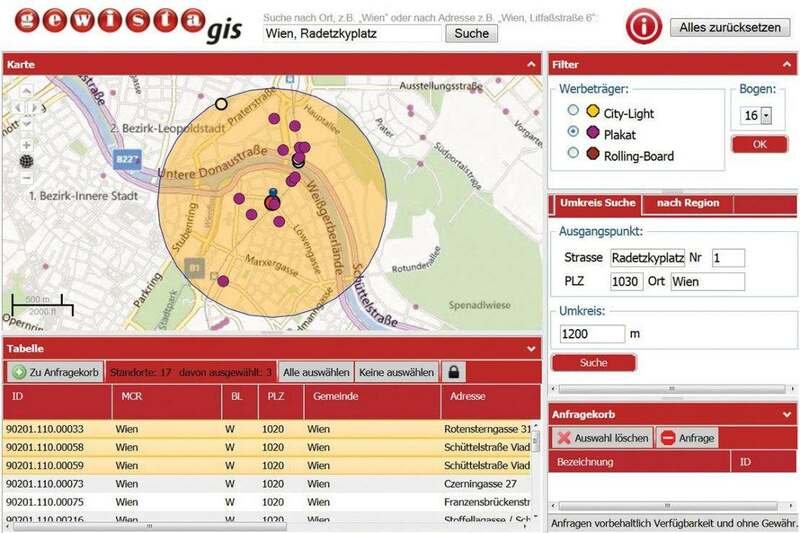 Gewista GIS is rounded out with the possibility to select areas based on one of the 15 Main City Regions of the Outdoor Server Austria (OSA), as well as a vicinity search for advertising media surrounding a predefined address. Every location can be selected and placed in a shopping cart and after entering the desired runtime and the starting day, an inquiry for the desired selection can be quickly made directly to Gewista. Yes, I am interested in your products and services. Please send me more information or contact me.